A two-day indoor/outdoor festival at the Utah State Fairpark! A limited number of 2-Day Mega Early Bird Passes will be available for $35.00 until the tier is sold out. A limited number of 2-Day Early Bird Passes will be available at $45.00 until the tier is sold out. 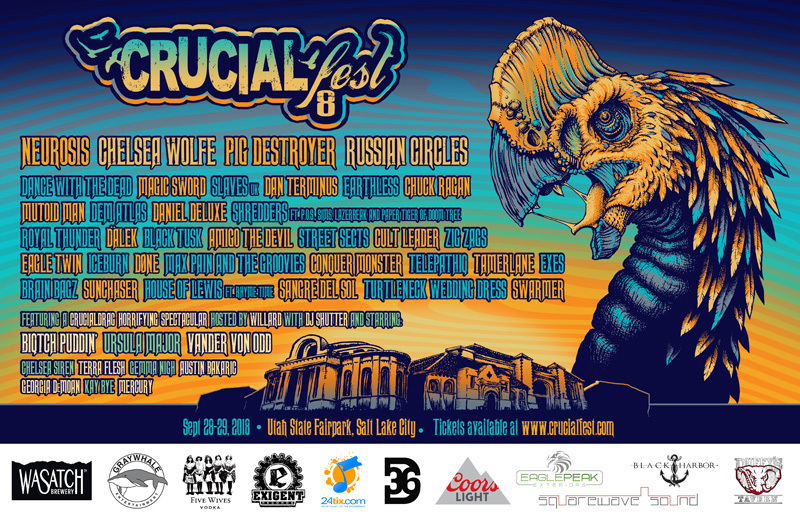 2-Day General Admission Passes are $55.00 in advance, $75.00 on first day of Crucialfest 8. All 2-Day Passes will be exchanged for wristbands at the event. Your wristband must be worn while in attendance and will act as your entry ticket on the second day of the event. Gold Spike 2-Day VIP Passes are $125.00 in advance, $145.00 on the first day of Crucialfest 8. Gold Spike VIP Passes include access to private lounge with liquor bar, complimentary snacks, Crucialfest swag, express entry at the festival gates, express entry to indoor stages, premium viewing at the main stage and unlimited rentry. Gold Spike 2-Day VIP Passes are 21+ only. All Gold Spike 2-Day Passes will be exchanged for wristbands at the event. Your wristband must be worn while in attendance and will act as your entry ticket on the second day of the event. Individual Day Tickets will be available Friday August 3rd. Crucialfest 8 is an all ages event. The headlining stage is all-ages, with headlining performers ending each night by 10:30pm. Indoor stages are all-ages until 10:30pm, at which point performances are limited to attendees over the age of 21. Food trucks will provide food options throughout Crucialfest 8. Beer will be available for attendees who are 21 or older. Liquor and wine will also be available to VIP pass holders from doors until 10:30pm, after which time it will be available to all 21 and older patrons. Re-Entry tickets will be available to purchase at the venue should you need to leave and return.